The weekend came and went pretty uneventfully. I wanted to go out and do things, since I’m finally out of the hospital, but I’m still not all that strong yet. I ended up going out for dinner Saturday night, but the rest of the time I stayed home. No need to risk damaging my leg in any way. But this is really a pretty boring situation to be in. I’ve started working more on my studying of Korean, which went on hiatus after my last surgery. Other than that, I’m just watching movies and staying indoors alone. I’m hoping to push myself a little more each day so I don’t go totally crazy being stuck at home, doing leg lifts to strengthen the broken leg. On that front, my muscle is starting to return. My right leg is still thinner than the left one, but the difference is definitely smaller. I also crossed a barrier so that my leg doesn’t look like it is bald anymore. It isn’t back to normal, but the hair transitioned from “unnoticeable” to “noticeable” this weekend. My mental state is relatively good, especially in the mornings when I wake up, but at times I sink and feel like my leg won’t ever return to normal. Some kind of combination of loneliness, frustration and fear. Despite this, I feel stronger each day and my leg feels much healthier than it did before. I also have full range of motion in my toes again, meaning the ankle is the only thing that needs serious rehabilitation at this point. If it wasn’t in the cast and I wasn’t using crutches, I’d actually feel normal. While sitting here, typing this, I feel like how I did before the leg was broken in the first place. I think this is a good sign, but I’m no doctor. I’m hoping to slip out and watch a movie this weekend, if I’m feeling up for the trip. A little at a time, I guess, regardless of how mind-numbingly boring it all is. As an aside, the weather is terribly rainy, which makes me worry about my leg getting wet. While I hope for the rainy season to pass, I know that the month afterwards will be nothing but sweltering heat. When that comes, I’ll be back to wishing for the rainy season. Well, yesterday was a pretty wild day. I woke up early and went to Yeonsu in order to have a job interview at the school that I mentioned before. The school provided a pretty substantial amount of evidence that the problem was that one teacher and I felt more confident about signing a contract. I was offered a contract and since they are looking for a teacher ASAP, I was told I could start on Monday and I would have an apartment on Friday. So I put off signing the contract so I could speak to a few more teachers who completed their contracts, just to be doubly sure. And I set off for my old workplace to get my documents I need to start the job. When I arrived, the boss was astonished at how much better I looked compared to when I was in the hospital. She said that my condition seemed considerably better than she thought. So she offered for me to return to my old position, but I wouldn’t need to teach for the next three weeks or so. She’s decided to offer me time to recover before I go right back into teaching and I could of course return to living in my old apartment. I was a bit excited about moving to Yeonsu, but then I decided to go ahead and return to my old school. The Yeonsu job would probably be easier than my old one, but this way I get more time to recover and I can work with my old co-workers. Then I’m not gambling with this other school either. I think that’s a better deal. That solves my homelessness issue pretty briskly and I don’t have to travel a far distance from Bupyeong, which is the area of the city I’ve always thought of as home. I felt a bit bad about the other school’s manager, since we spent a lot of time together in the interview and it really seemed like a sure thing for him. Now he’s stuck hunting a new teacher. But this seems like the best plan for taking care of my leg and I will get to stay with the co-workers I already know I like. It was actually a difficult decision, but I don’t feel like gambling while my health is in the state that it is in. Additionally, I’ll be given time to heal, which will be better for me. Today I found that I had pushed myself a bit hard. I woke up with sore muscles and really tired, but I hadn’t slept long enough, so I went back to sleep. After a few more hours of sleep, I woke up feeling better, but still a little rundown. I think yesterday I pushed myself to the limit and the rainy weather today is also taking a toll. Presently, my boss wants me to come in for a couple hours a day to get used to the school again and see students, but I’m not teaching yet. It’s a little awkward feeling, since I’m currently sitting at my desk typing this while my co-workers are all teaching. After class I’ll stand up and mingle with the students, but then I’ll be back to doing nothing. I guess it is just part of the transition. Well, I’m free. The weekend was long and difficult. I’ve been anxious. This morning I got a cast and was given care instructions in Korean, which I am quite pleased I could understand. My former co-worker and friend helped me get back to my old apartment where my belongings are. I took a long, but careful shower, then got a haircut. I’m now working on job hunting, but as it was the first time I got a job in Korea, it’s a little nerve-wracking. I’m currently looking at a school, but there’s a bit of a problem with it. It sounds like a good, solid job, but the guy I would be replacing is leaving on bad terms. According to him, he was fired so he wouldn’t get his end of contract bonus, while according to the school, he was fired for misconduct. The foreigner community are backing the foreigner who was fired, while an agent is discussing the job with me to sell me on it. Obviously, one of them isn’t telling the truth. The story of a fired foreigner trying to get revenge isn’t weird or shocking at all. But the story of a foreigner fired to avoid giving him a bonus is also not at all unusual. So naturally, it could go either way. Because I’m a shrewd person, I’ve grown skeptical. Because I’m a homeless person, I’m not giving up on the job outright. I’ve requested the school provide contact information for a current employee and one that finished their contract so I can have a chance to talk to them. If they have several happy workers or people who completed contracts successfully, then it isn’t a problem. If they don’t, I might have to give up on that job, unfortunately. I’ve had bad luck this year. I don’t need any more. It’s actually a melancholy feeling. I’ll be leaving the hospital soon and the time is counting down. This morning I woke up when the old women were bringing around breakfast. Usually I eat and return to sleep quickly, desperately attempting to return to my dreams. This morning, I ate my “hotdog sandwich”, one of many strange “western” options the hospital has, most of which the lunchladies have demonstrated a distinct lack of understanding of. I do applaud them trying. My last hospital gave me rice and kimchi early in the morning, which I have trouble stomaching at that hour, even though in general I love Korean food. Afterwards, my coffee, earlier than usual, and my red ginseng tonic. Before my injury, I drank at least one dose of the tonic each afternoon at work before starting my preparations. In the hospital, I drink it daily when a friend has been kind enough to bring me a box of bottles. This is one of my last tonics and is of a more expensive brand than I usually drink. Fairly early I was visited by a banker and the financial guy from the hospital. Squaring away my insurance and my finances. In Korea, it is illegal to leave a hospital without paying. It isn’t like the US, where you’d just get billed down the line. However, the rates are much lower and nothing is inflated like US healthcare. Regardless, I’ve racked up a large bill in my 114 day stay and the course of my three surgeries (at this hospital). Digging and struggling, I’ve secured a bed for Monday (in my old apartment) and I can stay on a friend’s couch for up to a week, giving me eight days of shelter. My Visa is still sponsored and protected by my old employer until next year, so I shouldn’t have trouble on that front. That just leaves job hunting. I’ve got potentially two interviews on Tuesday, although that isn’t set in stone. One is for a job that sounds quite good, but would have me moving a bit to the west. Puts me a little farther from Seoul, but it’s a small sacrifice. I’ve started the process of assembling the paperwork for the University position in the south, even though the location is even worse. Unfortunately, my old University in the states has made transcripts hard to obtain (even just unofficial ones) without a formal request, which is difficult to fulfill with my limited means here in the hospital. I’ve decided to move forward with it on Monday. I’ll try to keep posting, although I may disappear for a bit. Since I suspect I’ll be spending a lot of time in Cafes, stealing wifi and a place to be, I should be able to keep updating. So here we are. The final surgery is complete. It happened a bit over a week ago, but you can’t blame me for not posting. Sitting up was difficult after the surgery was over, but now I’m feeling rather chipper. Monday, last week, they performed the surgery. I was put under, then awoke to a cacophony of light and sound. I think that’s how surgery always is. Waking up I found a metal-less leg and a few stitches on my side where a chunk of bone was extracted from my hip. Initially, the hip bothered me more, the first day with me unable to even sit up. The next day, sitting up wasn’t so hard. Wednesday I was getting out of my bed and into my wheelchair. The effort was exhausting, and my left leg, the good leg mind you, would buckle if it was used at the wrong angle. Pain would shoot through my side and I’d collapse. By Thursday, I found the entire exercise much easier. By the weekend, I could do it without much effort. This week I’ve been working on my crutches. Presently, I can move just as fast and effortlessly as I could on crutches before the final surgery. The hip doesn’t bother me until after I sit back down after exercising. Even then, it is mild, like if you did too many sit-ups. Of course, stamina is an issue. I can make it five laps around my ward and I’m winded. I could probably go a bit father, but without a goal, five laps seems like good exercise. I’ll continue to work on my stamina until my exodus from the hospital, which I’ve been told is Monday. If my wound looks clean and closed, they’ll removed the staples and I’ll be able to go out. My friend Ted is offering to help me out on Monday. And that is where things get frighting. Talking to my old boss, I discovered I would be given no quarter. If I couldn’t work like I did before my injury, I can’t come back. Unfortunately, I can’t. Not yet. My stamina is low and I need to sit down often. I can’t walk without the aid of crutches either. And don’t be commenting about how I could sue her. I live in Korea, it doesn’t work that way. I also don’t want to force myself back into a job where my boss doesn’t want me. It is detrimental to everyone. Unfortunately, my “plan b” as it were, has no space for me. The guy who offered me his couch is now not certain his roommates will allow it. This morning I started falling apart realizing I was leaving the hospital into a great void. No job, no home and living in a country that primarily speaks Korean. And the rainy season is beginning. I still don’t know what is going to happen, but I have some new leads. A good friend of mine also has a job for me to the south, but I’d be living in the countryside. I’m more of a city person, but when it comes down to it, beggars can’t be choosers. All I know is that July will probably be the hardest month of an already exceedingly difficult year. Yesterday was the first part of a two part operation to rebuild my leg. While I’ve been floored with the infection, an eternal fixation has held my leg together. Five metal spikes, four in a row below the knee with the fifth in the ankle. Additionally, three lengths of wire, each driven through one side and out the other. Two of these were in the heel, one of them in the ankle near that fifth spike. A metal bar and halo completed the whole contraption. After so long, having it seemed somewhat second nature, but yesterday the removed it. Can’t operate with all that metal in the way. 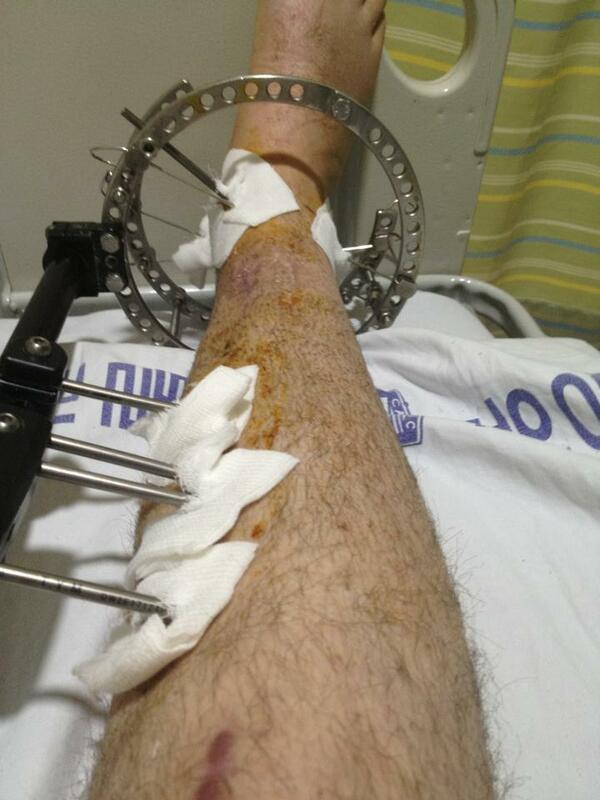 The last image of my leg before the operation to remove the fixation. There was a bit of miss communication among the doctors with exactly how the device would be removed. My surgeon told me I’d get no anesthetic and the whole procedure would be about ten or fifteen minutes. But the assisting intern doctor said I’d have local anesthetic and sutures at the end. It turned out that the surgeon was right. No painkillers what so ever. He used a wrench to loosen the halo, snapped the wires with wire cutters and pulled the bone spikes out one by one. I had expected to have more soft tissue pain than anything and I expected the through-and-through wires to be the most painful. Didn’t even feel them. And the bone spikes were the worst kind of pain, but it was rather brief. I laughed nervously and counted the spikes off as I felt them pull out. My count would then be confirmed by a metal “ding” of a spike falling into a metal tray. I couldn’t see what the spikes looked like after they came out of the leg, but I was curious. The worst one by far was the one in the ankle. After the surgery, there was just mild pain, but for some reason, waves of nausea. I fought with the urge to throw up for most of the day. I didn’t take any kind of pain shot because the pain was that obnoxious level where you feel thoroughly uncomfortable, but it isn’t that intense. Painkillers, especially the shot I get here, is hard on my liver. Or kidneys. I don’t remember exactly what the nurse said, but I know it is one of those filtration organs. Either way, I need those guys. A lot of friends checked in on me to see how I was doing afterwards, which is always a nice feeling. At night, I took the pain shot and went to sleep. They woke me at 2am for an antibiotic shot. I struggled to get back to sleep and I took a second pain shot around 4am. Somewhere around 5am a nurse came in and talked to me about saline for a good 10 or 20 minutes. I understood most of what she was saying, but I didn’t understand the punchline. My Korean has improved, but I’m not fluent or anything. Eventually she left and the saline wasn’t attached to my body. I either ended up refusing it, or it was optional and I didn’t opt in. Today I talked with another nurse and pointed out I’d rather be sleeping at 2am. She laughed and agreed with me and pointed out I’d get about three antibiotic shots a day until my final surgery. Afterward I spent some time with my mother and an orderly named Andy. We had a good time eating and talking. As a whole, my leg isn’t bothering me without the metal fixation, but there is a strange sensation of something missing. I had grown accustom to having that metal bar on the inside of my leg. I switch at times from a calm acceptance of my future operation and an overwhelming dread. I must admit I’m a bit scared of the operation and somewhat worried about what may happen post-surgery. But there is no alternative. We all have to do what we have to do. I made coffee for myself in an irregular cup. Somewhat uncomfortably large and covered with white and silver patterns. I actually dislike the cup, but the large size allows me to make a larger cup of coffee. As I was brewing it, I realized I wanted to put my thoughts back into this blog. I haven’t posted in so long, but that is understandable. As a journalism major, I was encouraged to write a blog or write personal stories to “keep me in the habit of writing”. As I’ve grown older, I’ve realized that writing isn’t a habit, but rather a skill, which they wanted me to practice. I’ve found it is fruitless to have a habit of writing because the words come out dead and lifeless. This writing is a feeling. And at this time, my thoughts are fluid and I can share them with you. I can’t promise that I will keep updating, but I will share my feelings here as often as it feels like something I can do. For those who are not that close to me, I broke my leg in the winter while I have been living in Korea. It has been touched up and I intended on telling the entire story. At this time, I won’t be finishing that story. Instead, I will quickly catch you up to my current state. That break in my bone cracked my entire state of living. Following the break, I have been diagnosed with Osteomyelitis – a bone infection – and because my initial doctor failed to catch the infection quickly, my new doctor was at one point talking about amputating the leg. I had an operation that resulted in infected tissue being cut from my leg and external fixation has been applied to my leg. To be more direct, there are a half dozen nails driven into my bones and a few wires that pass through one side of my heel and out the other. This is what hold me together while I deal with antibiotic therapy. For a period of six weeks, I had two injections of antibiotics per day. Eventually, the antibiotics took too much of a toll on my body, resulting in a harsh allergic reaction that tore up my skin, gave me a fever and made me feel like death. For two weeks afterward, I switched to an IV drip anti-biotic. It eventually triggered severe dehydration because drugs are not without side-effects. For an additional six weeks I took pill antibiotics, which eventually caused extreme nausea and an additional skin problem. Part of the nausea may be psychosomatic, although this is my personal theory. I become violently nauseous exactly at the hospital meal times and eating the hospital food at night causes me to gag and heave. If I leave the hospital to get food I don’t feel excited to eat it, but the reaction isn’t as strong. I think I’ve just reached my limit for eating the hospital food on a daily basis. At this time, I’m sitting and waiting for my final operation to be scheduled. When it is performed, the metal will be pulled from my bones and I will get an incision at my knee. And IM nail, which is more like a metal post than a nail, will be driven through the top of my bone. My doctor told me about the procedure hesitantly. He expected a negative reaction since I have been through such a procedure before. It is quite similar to my first operation that was performed by a different surgeon and became infected. I understand why he thought I might become uncomfortable, but the most efficient surgery with the lowest complications is the best surgery. Just because I suffered through the complications doesn’t suddenly made the other surgeries less likely to have complications. It doesn’t make their success rates higher. Perhaps my outlook is warped. That is one thing I have thought as I have spent these last four months in this hospital in Korea. When I found out I could lose my leg, I felt drained for a day or two. I think I cried a little. But when it comes down to it, what are our alternatives? Raging against fate? Cursing God? By the third day I was smiling and joking again. Sure, I was afraid, but if they cut my leg off, I just have to live with that. I’d give a prosthetic and I would live my life the best I can. If my surgery is a success, I’ll go through rehabilitation and live my life the best I can. The outcome from the perspective is actually very similar. In the process of being in the hospital, I lost my job. How couldn’t I? A small school can’t survive with one-sixth of the staff missing. I felt a twisted pride that I was very difficult to replace. At one point when my boss and I had a fight, she claimed I’d have trouble getting a job at another school and that I could be replaced easily. I smiled to myself when my friends offered me jobs and she couldn’t find anyone to take my place for a couple months. I knew it was hard on my poor co-workers, but nothing feels better than having your value confirmed. Although, losing the job meant I lost my home, which was paid for by my school. After I had broken my leg, but before I was re-admitted to the hospital, I began dating a girl as well. She was very tall and attractive, although in a slightly uncommon way. She was a guitar teacher and she was in an indie band. In many ways, she was more or less my ideal type. But after I was re-admitted to the hospital, I have never seen her again. I got one message that she was simply too busy and then that was it. She’s been gone ever since. Perhaps this would have happened even if I didn’t end up in the hospital. However I can’t help but feel like things could have been different. While I don’t entirely live in the most frugal manner, I am quite good at saving money. I had no debt when I came to Korea, and I had saved a decent amount of money while still purchasing myself the style of clothes I like, doing what I wanted with my friends and purchasing a new laptop. But at this time, those savings had to be used for my hospital bills. Being sick here in Korea is much more affordable than being sick in the United States, but four surgeries and six months of hospitalization isn’t cheap anywhere. So here I am. No girlfriend, No job, No home, No money. And I’m in a wheelchair. 6000 miles away from the United States. And yet, this is alright. I’ve experienced so much pain, yet it fades away. I’ve lost so much, but I can always rebuilt. My grandfather says that we shouldn’t worry about things we couldn’t change. When I was working for newspapers and documentaries, I couldn’t understand. How could you not be worried about politics? About human cruelty? How could you blame me for growing cynical and jaded? So disillusioned and frustrated with the job market and the situation in the United States that I ended up become a teacher on the other side of the Earth? Now, I can see that it isn’t so hard. There are things in life that cannot be changed. If, back on that snowy day on December, I had waited in the cold and took the bus, I wouldn’t have broken my leg. But I can’t regret that decision. How could I have known? It isn’t like I can change what happened. All I can do is look forward. I’ve made plans to remain in Korea and I will be replacing my job to the best of my ability. I’ll meet a girl who hopefully will stick around if I’m unlucky enough to be injured again. I was able to learn a lot of Korean in the hospital. It’s so easy to be weighed down by petty little things and to grow frustrated with things. But you’re doing it to yourself. This holds true in everything. If you figure this is just how things are, you can manage through anything.